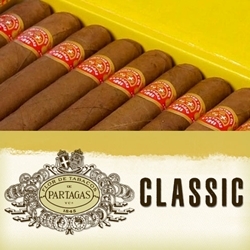 Well-grounded in Cuban roots, Partagás Classic cigars are hand-rolled premium cigars produced in the Dominican Republic. Constructed individually by highly skilled cigar rollers, each Partagás Classic premium cigars are infused with mixed fillers of Dominican (Piloto Cubano), Mexican tobaccos, a Mexican San Andrean binder and wrapped up tightly inside an elite Cameroon wrapper. The superb cigar rolling that has always been done under the Partagás brand gives this strong premium cigar a flawless appearance. Consistently a superb cigar to smoke and relax with, the Partagás Classic line are hand-rolled premium cigars that make an excellent choice for any cigar connoisseur. Smokers Discounts has made it easy and affordable to buy hand-rolled premium cigars online. A variety of sizes and flavors are listed below in our online cigar store. Each of these styles are in stock and available today at a low discount price. Call us for more details!